Here at FasterSkier, the primacy of the written word is often emphasized. 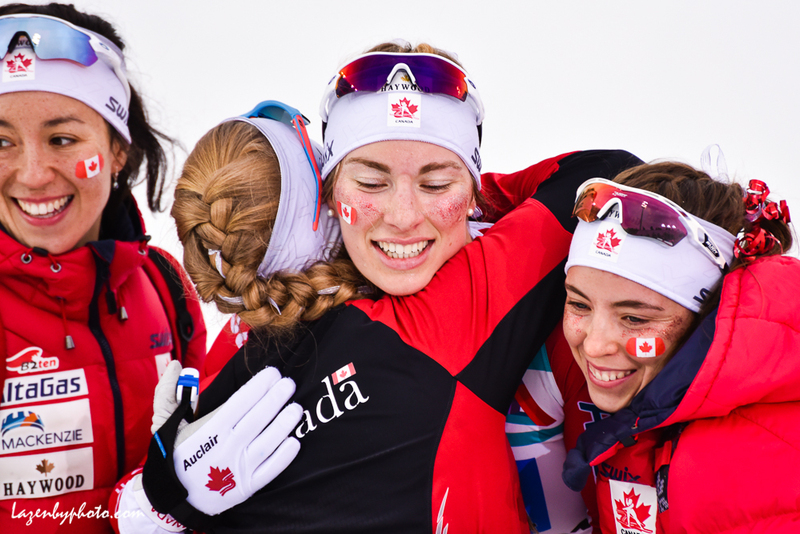 We remain text driven, but we have delved into videos to help our readership learn more about the sport and of course, we rely on the eyes and vision of sport photographers to deliver visual stories in a way words simply cannot. John Lazenby is a model of the artist and the deep-in-the-trenches photographer who creates some of the images we feature on FasterSkier. Lazenby lives in Vermont where he practices his craft. You can check out some of his work at his website. 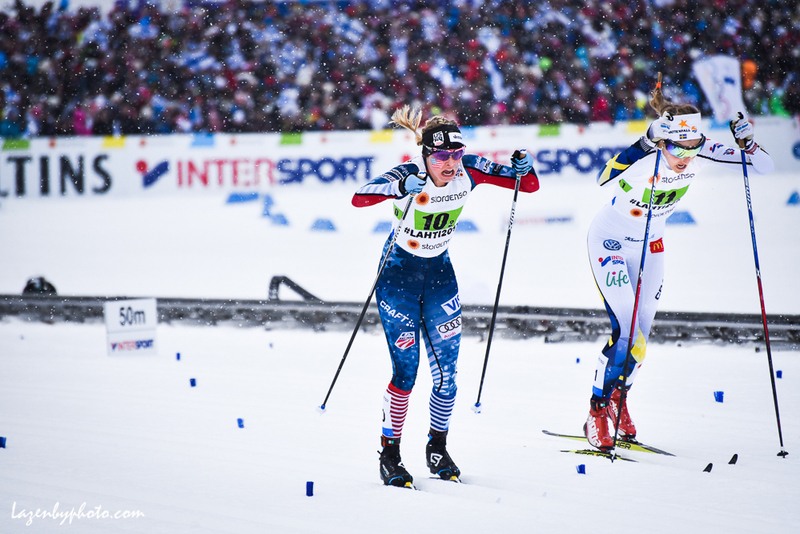 At major nordic ski events, Lazenby remains chill, and is rattle-proof. Sub-zero Lahti, Finland cold is not too cold for Lazenby. Sleep deprived and on a Vermont sunrise internal time-clock is no deterrent to cover the action and send photos our way. His workhorse persistence is an asset to our community. We are better for it. 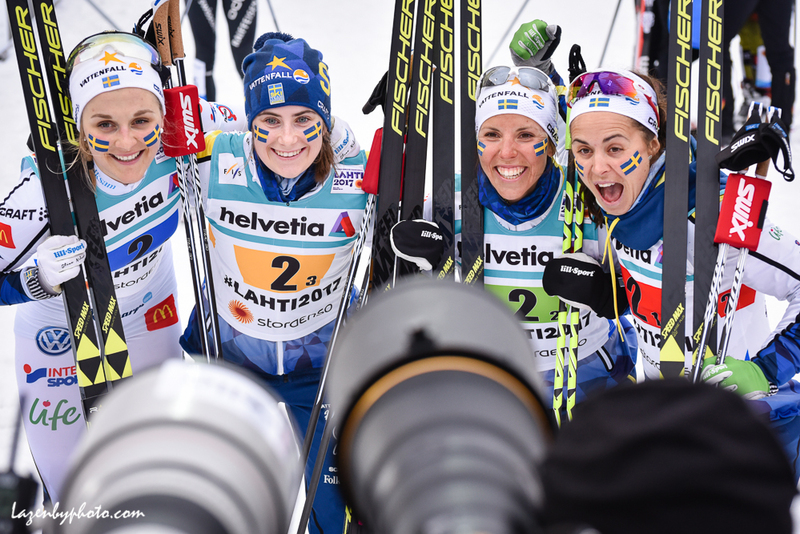 Lazenby will be shooting for FasterSkier in Seefeld, Austria this February at the Nordic Ski World Championships. Well before then, we wanted to pull together a sample of Lazenby’s kind work as we bring him out, just a little bit, from behind the lens. Click the image twice for a big look. 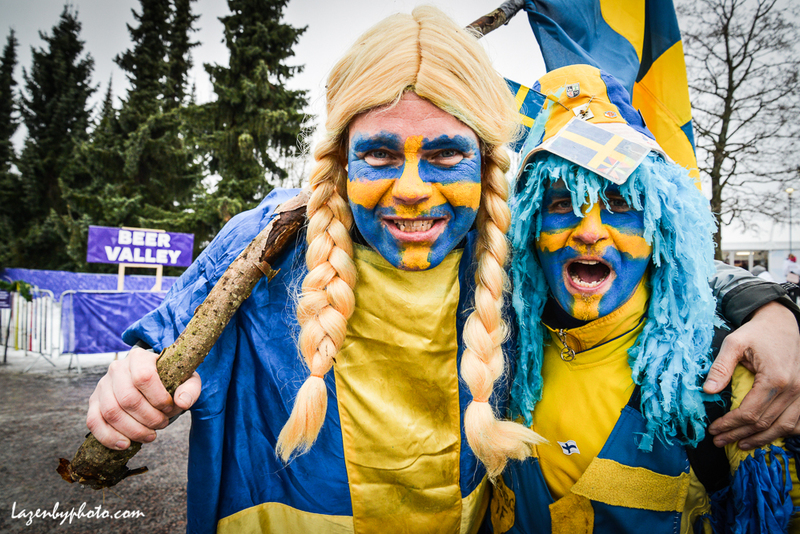 World Championship enthusiasm from these Swedish fans at Lahti in 2017. There’s more to covering a race than just what happens on the track, and fans are a big part of that. 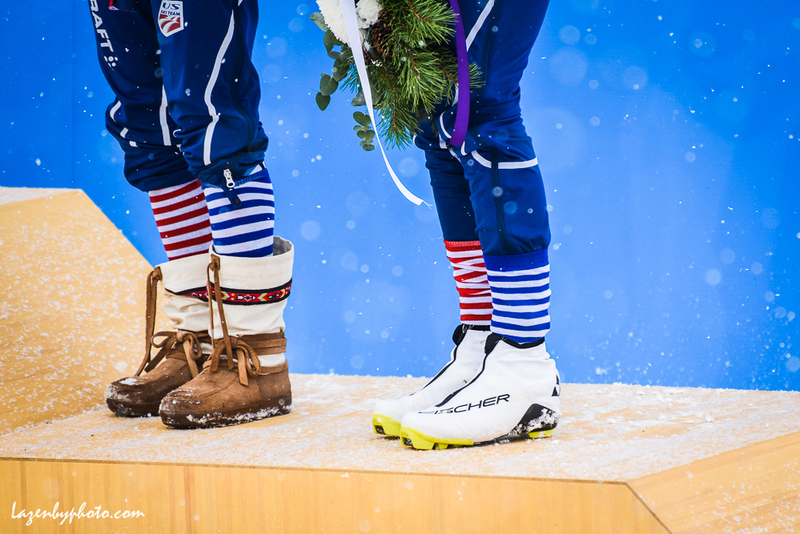 Jessie Diggins (left) and Sadie Bjornsen wear the USA’s lucky relay socks as they stand on the podium after taking third place in the women’s classic team sprint at the 2017 Nordic World Championships in Lahti. 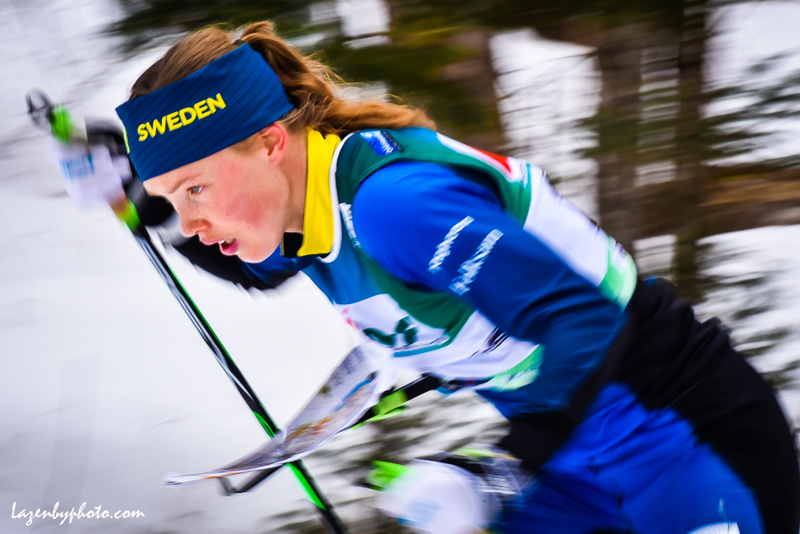 Eventual winner Sweden’s Tove Alexandersson in the middle distance race at the International Orienteering Federation World Cup at Craftsbury Outdoor Center, Craftsbury, VT. Preparing for racers to arrive at the map exchange in the distance race at the International Orienteering Federation World Cup at Craftsbury Outdoor Center, Craftsbury, VT. 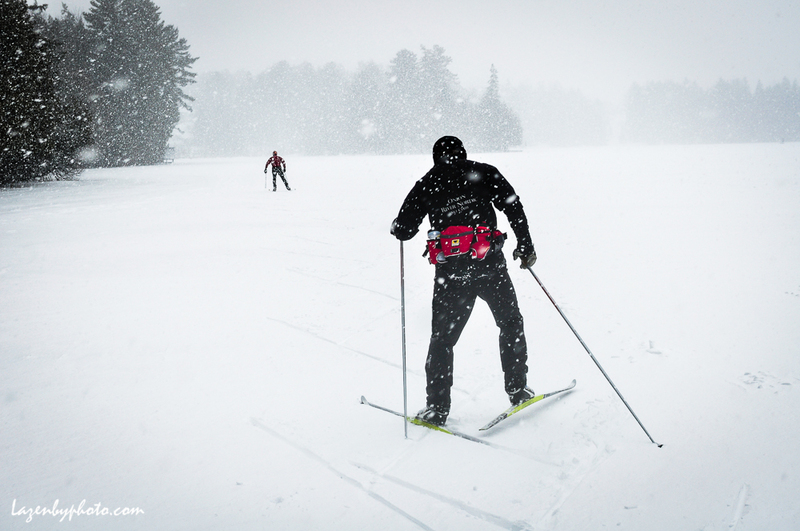 Sometimes it seems wrong to get your camera wet in falling snow: but what’s skiing without skiing in newly falling snow and what’s ski photography with images of a snowstorm? I usually keep at least a small camera with me in a belt pack when skiing. 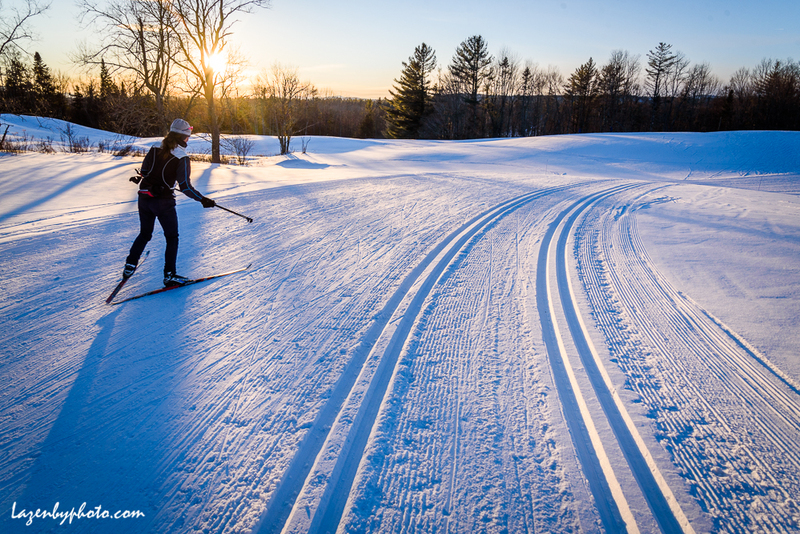 As the sun set, it was so cold that the battery in my camera froze into a non-working lump during this late afternoon masters’ training session at Craftsbury Outdoor Center last January. But the masters kept skating in the cold, squeaky snow and I was able to get this image before the battery went dead. 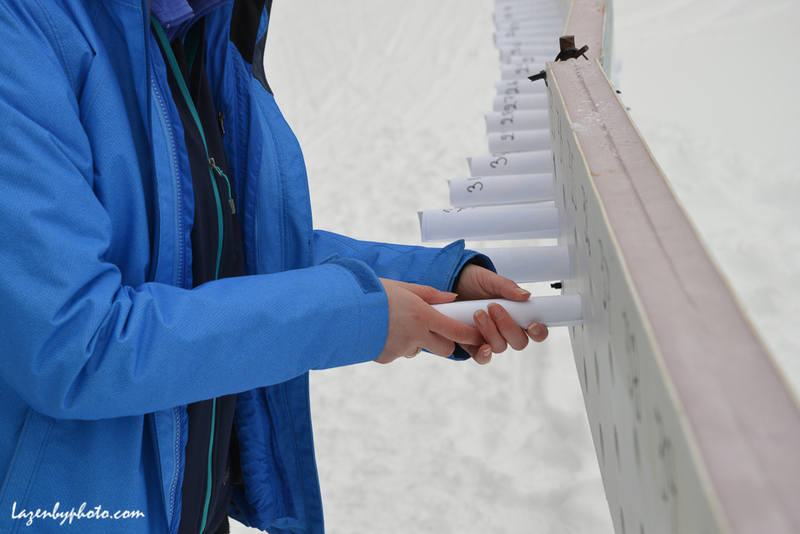 Finland’s Aino-Kaisa SAARINEN discards a drink during the 2017 30-kilometer competition at the World Nordic Ski Championships in Lahti, Finland. 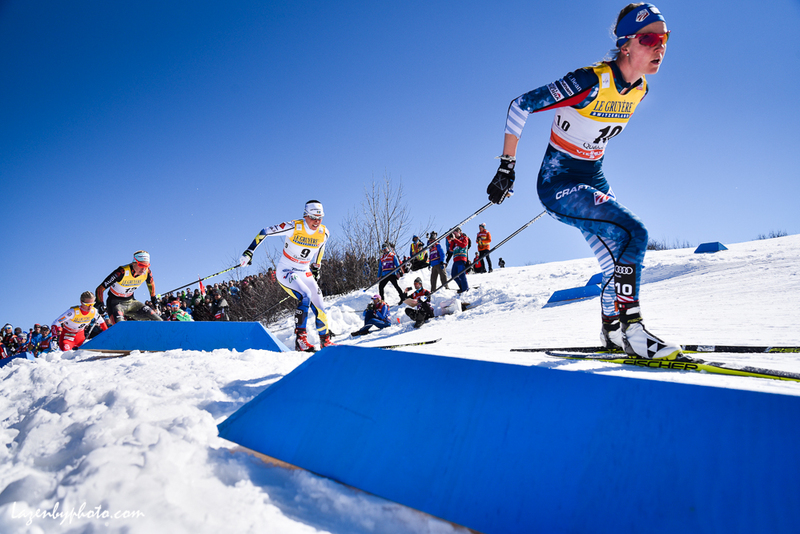 USA’s Sadie Bjornsen competiing in the 2017 World Cup finals on the Plains of Abraham, Quebec City, Quebec, Canada. Behind her is Charlotte Kalla, Sweden. 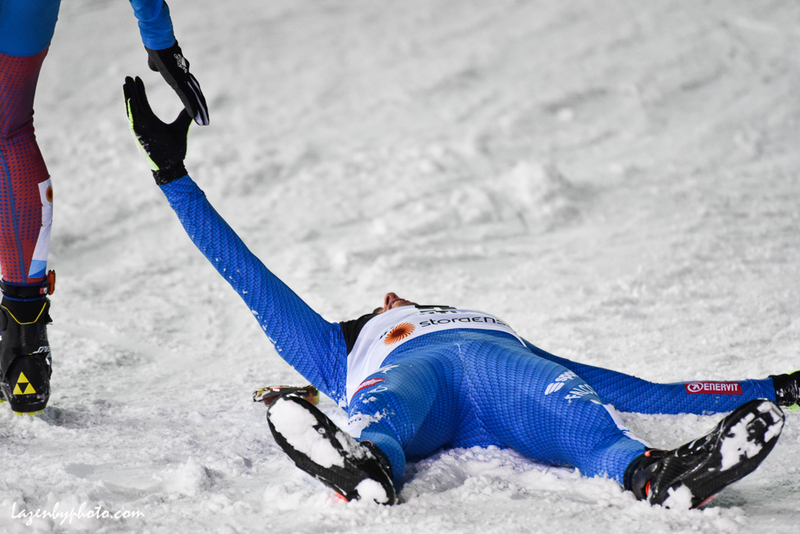 Italy’s Federico Pellegrino reaches up to shake the hand of Russia’s Sergey Ustiugov after Pellegrino won his first World Championship gold in the sprint in Lahti in 2017. I liked the simplicity of the situation and the fact the Pellegrino, having finally achieved this goal, was flat-out on the ground. 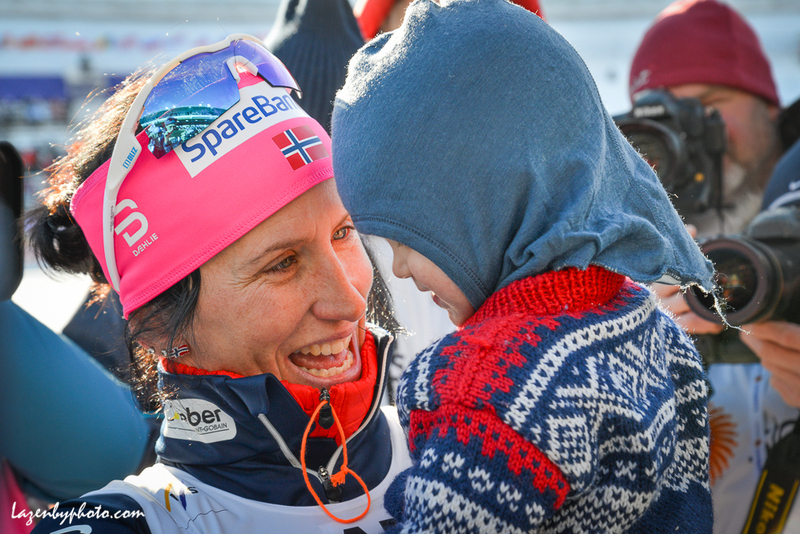 Norway’s Marit Bjorgen with her son, Marius Bjorgen Lundberg, after she won the 15-k skiathlon at the 2017 World Championships, Lahti, Finland. 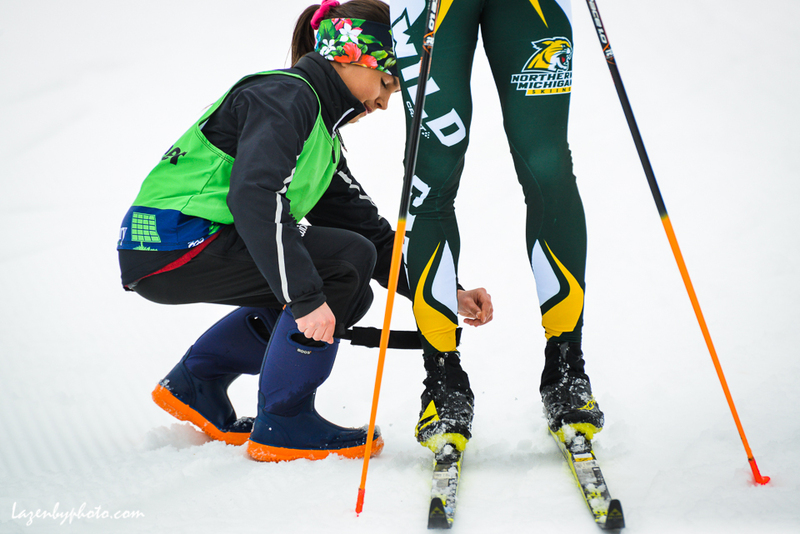 There’s often a lot going on on the sidelines of a race. “Klaeboing” up a hill is the well-known trademark of Norway’s Johannes Hosflot Klaebo, but it was fairly new when he simply stepped out of the classic track and ran up the big hill just outside the ski stadium in the team sprint in the 2017 World Championships, Lahti, Finland. I was pretty far away, but was able to get fairly close with a telephoto. You can see the technique in the way he lift his right ski. 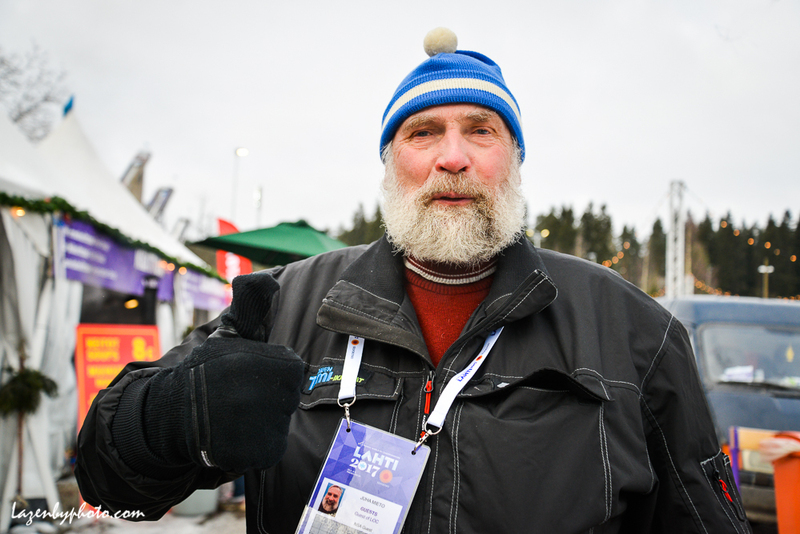 Considered one of the most popular men in Finland, big Juha Mieto’s racing days were in the 1960s and ’70s, but the four-time Olympian, unmistakable because of his size and his big personality, was out greeting the crowds at Lahti in 2017. 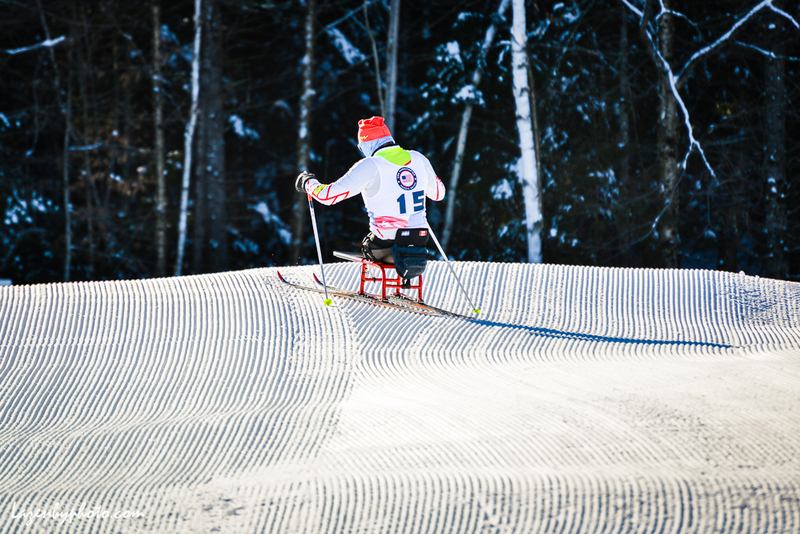 What makes Jessie Diggins Jessie Diggins? Talent, skill, work ethic, toughness, persistence, and sparkle, yes, but also the fact that when she is in contention she simply will not be denied. 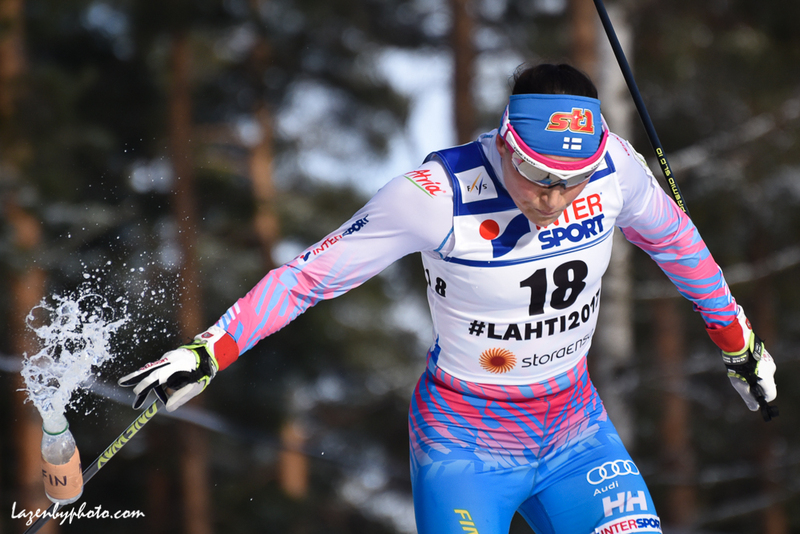 This photo demonstrates that attitude as she out sprints Sweden’s Stina Nilsson at the 2017 World Championships in Lahti, Finland for a bronze medal in the team sprint with Sadie Bjornsen. 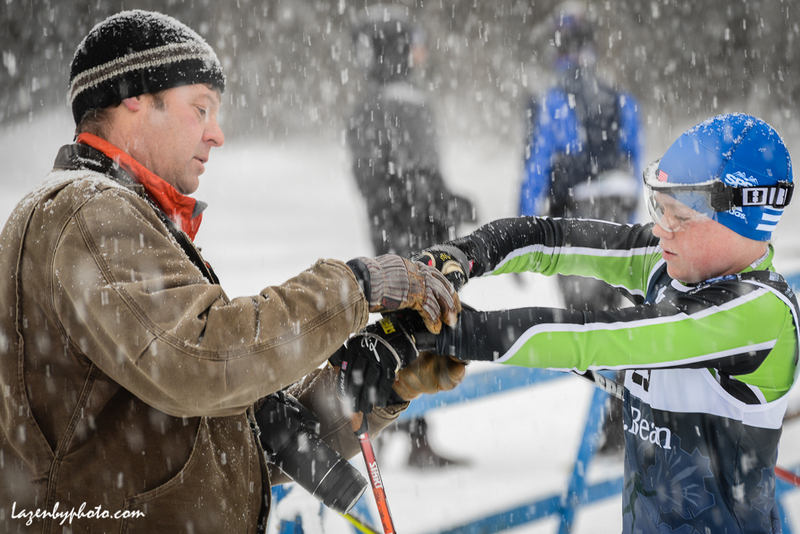 Craftsbury Nordic Ski Club racer Jack Young of Jay, VT, gets some help from his father, Chris, to adjust his pole straps in the start corral, NENSA Eastern Cup, Craftsbury Outdoor Center, December 2016. 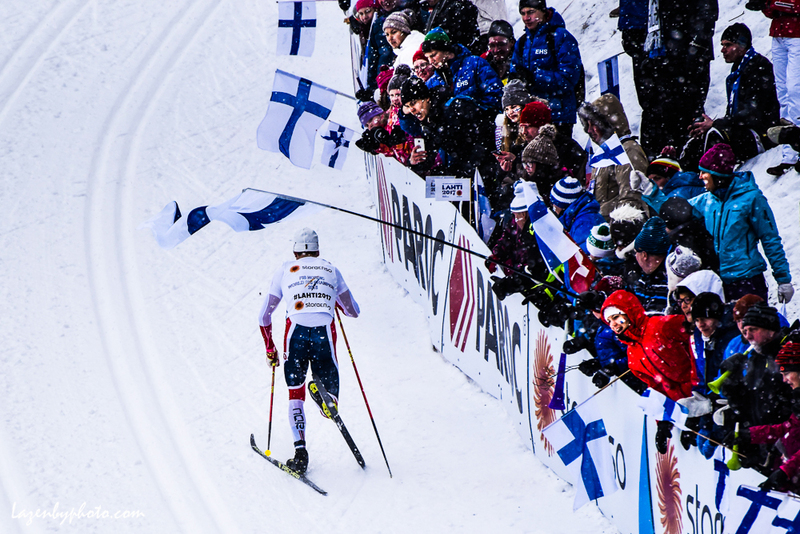 2017 Lahti FIS Nordic World Ski Championships; Norway’s Emil Iversen skiing with a broken pole down the finishing stretch after tangling with Finland’s Iivo Niskanen; 200 meters from the line; which cost Norway gold in the men’s classic team sprint at the 2017 Nordic World Championships in Lahti; Finland. 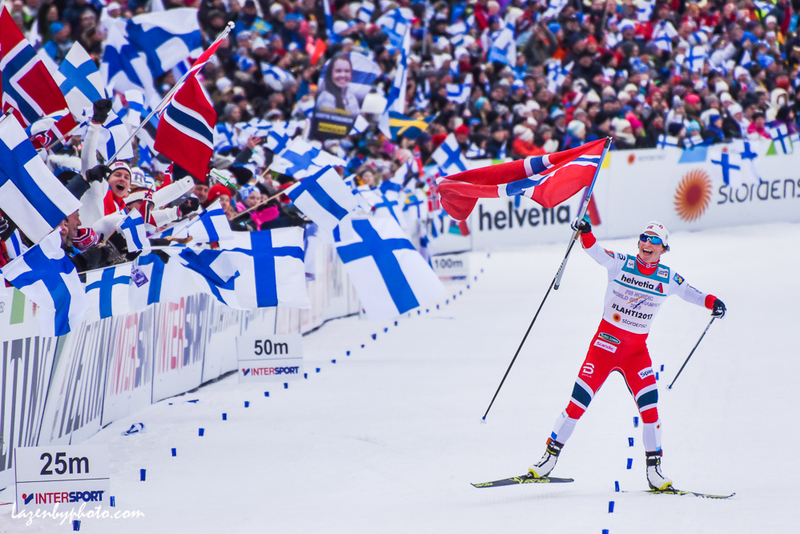 Marit Bjørgen carries the Norwegian flag across the finish line as Norway wins the women’s 4-by-5-kilometer relay at the 2017 Nordic World Championships in Lahti. 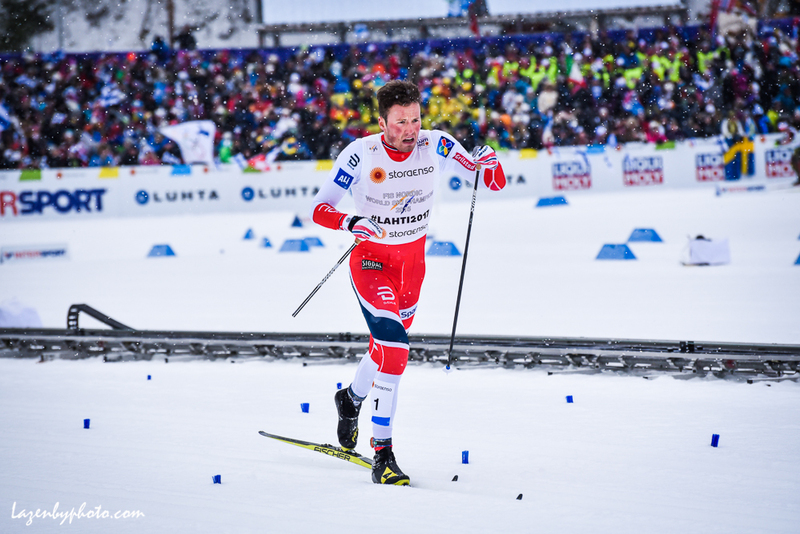 It was Norway’s 100th world championship medal. 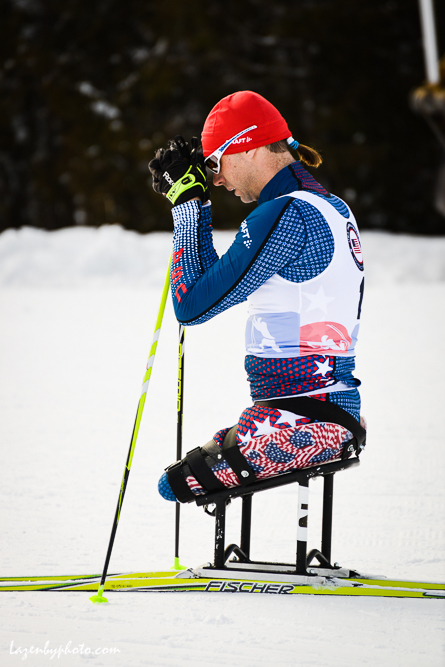 US paralympic team member Andy Soule prepares for a race at the US Paralympics Nordic Skiing Festival at Craftsbury Outdoor Center in January of 2016. Soule joined the Army after the September 11, 2001, terrorist attacks and lost both legs when an IED detonated next to his Humvee.